Christmas ornament crafts can be made from anything. The one pictured here looks very elegant and expensive except it doesnâ€™t cost very much to make (people don't need to know that though). You can make it with any color but I think the white with white beads looks very elegant. They would also look great made in a red with silver beads or blue with silver beads. It just all depends on what color you like. It is very easy to take styrofoam balls and turn them into a work of art. All you need is a little imagination and some craft supplies. These were made many years ago and they still look like new. You can make them any color you want. It just depends on if your dÃ©cor is country, traditional or Victorian. Everyone loves handmade ornaments and they also make great a gift to give to family or friends. For a party at work, just make one of these and give it as the gift. It will be greatly appreciated! Start at the bottom of the ball and put some hot glue all the way around the ball. With the nylon cording start winding it around the ball. Add more glue and continue up to the top of the ball. When the ball is dry glue the string of silver beads on. Start at the bottom and work your way up. You can use hot glue for this process if you want. With about 6 inches of the silver beads make a loop and glue the ends to the top of the ball. This will make the hanger to hang the ornament. Make a pretty little bow with the ribbon and glue on the top. Your Christmas ornament is now ready to hang. They are a lot of fun to make and look so beautiful hanging on your tree. 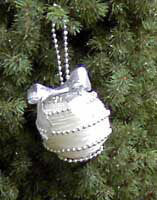 There are so many Christmas Ornament Crafts on this web site and I will be adding more all of the time.